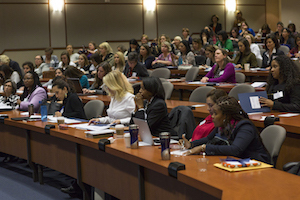 The Pepperdine Center for Women in Leadership, in partnership with the Pepperdine School of Public Policy, will host the Women in Policy and Politics Symposium at Wilburn Auditorium in Malibu on Monday, October 23, from 8:30 AM to 2:30 PM. As women have advanced as leaders within the public sphere, progress made in the realm of politics and policy is among the most prominent. Internationally, as well as within the United States, women in positions of political leadership have paved the way for even greater strides for future generations. Tickets are free for Pepperdine students and $25 for faculty, staff, and community members. For additional information, and to register to attend, visit the Women in Policy and Politics Symposium page on the Eventbrite website.